WASHINGTON—U.S. 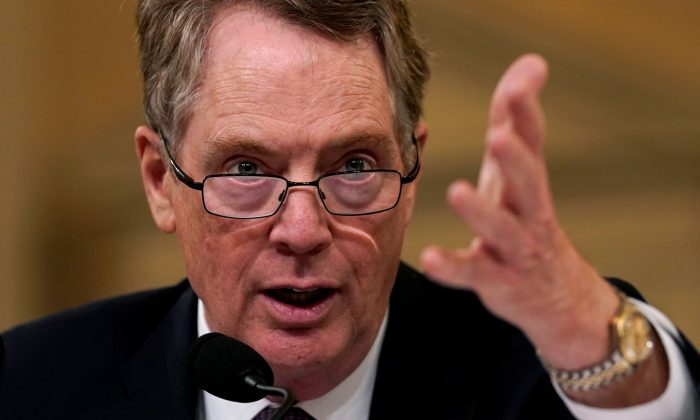 Trade Representative Robert Lighthizer and Treasury Secretary Steven Mnuchin plan to travel to China next week for another round of trade talks with Chinese Vice Premier Liu He, a Trump administration official said on March 19. The resumption of face-to-face talks, the first since President Donald Trump delayed a March 1 deadline to raise tariffs on $200 billion worth of Chinese imports, marks an acceleration of negotiations aimed to end an eight-month trade war between the world’s two largest economies. “Talks with China are going very well,” Trump said at the end of a White House news conference with Brazilian President Jair Bolsonaro on March 19. The administration official who confirmed the new round of talks didn’t provide further details on the expected duration of the talks or any further rounds. The source, who wasn’t authorized to comment publicly on the matter, spoke on condition of anonymity. The Wall Street Journal reported that following next week’s negotiation in Beijing, Liu would travel to Washington the week of April 1 as the two sides aim for a deal by the end of the month. The report, citing unnamed administration officials, said the trade talks were in the final stages. The Journal report and Trump’s latest upbeat comments contrasted with a Bloomberg report on March 19 that progress in the talks was slowing as Chinese officials have “stepped back” from some initial promises they made on improving intellectual property protections demanded by the United States. Washington and Beijing have placed import duties on hundreds of billions of dollars worth of each other’s products. Washington has demanded that Beijing implement stronger protections for intellectual property rights and end policies that it says coerce U.S. companies to transfer technology to Chinese firms in exchange for access to the Chinese market. The United States has also demanded that China rein in hefty industrial subsidies that it blames for the buildup of excess production capacity in China. Since late February, the two sides have worked to refine language on reform pledges that China intends to take, along with an enforcement mechanism aimed to ensure that Beijing will follow through on such changes. But Chinese officials have sought an immediate end to the tariffs that Trump has imposed on about $250 billion worth of Chinese imports. Trump administration officials have not specified any plans to roll back such duties. The deal under negotiation is also widely expected to include increased Chinese purchases of American goods, including farm and energy commodities, to help reduce the U.S. goods trade deficit with China, which hit a record $419 billion in 2018. Among purchases of U.S. goods under consideration are new Chinese orders for Boeing Co. jetliners. But the grounding of the company’s 737 MAX models following the recent Ethiopian Airlines crash has cast a shadow over immediate hopes for such a deal, according to industry sources. China also made its biggest purchases of U.S. pork in nearly two years last week, according to U.S. Department of Agriculture data on March 14, as Chinese hog prices surged after an outbreak of a deadly swine disease. Buyers in the world’s biggest hog producer and pork consumer struck deals for the meat despite import tariffs of 62 percent imposed by China on U.S. pork. The duties had slashed China’s imports of U.S. pork since last summer. But the months-long outbreak of African swine fever in China, which has spread to 111 confirmed cases in 28 provinces and regions across the country since August 2018, has left the country with no choice but to purchase U.S. goods. China also recently resumed purchases of other U.S. farm products, including soybeans and sorghum, that face retaliatory import tariffs.